I just discovered that Scientology, or at least Dianetics, is within the band of my research. It is vitalist in nature. The purpose of Dianetics processing is to remove blocks in the flow of life energy. 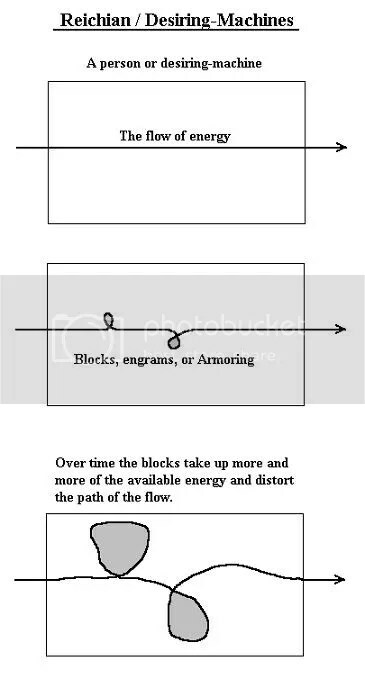 L. Ron Hubbard just called the energy theta and the blocks engrams. The main difference between this and other vitalist practices is that this, at least at the stages I’ve had access to, has been much more mental than physical. Interesting diagrams. I’m a Scientologist, myself, just happened to stumble across this. Did you ever read Dianetics, or get a chance to see the Dianetics DVD? If not, I think you’d find it pretty intriguing. I’ve got a bunch of items on such in my blog, if you want to have a look. Yeah, I’ve read Dianetics but the book that lead to that post is Science of Survival. I highly recomend it if you can find a copy. Yes – I’ve read Science of Survival as well, and can definitely see where you got your data from. From what I can see on your blog, however, you may want to progress on and hit a couple of the other basic books on the subjects of Dianetics and Scientology by L. Ron Hubbard. Dianetics: The Original Thesis, and Scientology 8-80 are ones I’d reccommend, as well as the Philadelphia Doctorate Course lecture series. This forum needed shinakg up and youve just done that. Great post!